The weather’s taken a turn for the colder in the mountains, so I’m off to do some snowboarding tomorrow & Friday. I’ve only snowboarded once before, and my memory is that I had fun, but my tailbone hurt a surprising amount after a day on the slopes. I’m taking a lesson or two this week, so I’m hopeful I can minimize the pain. I’m starting to feel pretty settled in my apartment, and made even more progress yesterday as I solved one of the things that was hounding me for months. My bed squeaked. Really loudly. And not just when I jumped on it or anything, it squeaked when I rolled over, when I breathed, or when I looked at it funny. I’d tried on several occassions to isolate the noisemaking parts, but to no avail. Finally, I got a can of 3-in-1 yesterday and found the culprits (boards under the mattress – it’s a Murphy bed). Last night’s was a blissful, squeak-free sleep. I’m thinking about getting a TV. I’ve been without since May, and mostly don’t miss it, but occassionally I do. Not sure if I’ll opt for a Craig’s List Special or go all out and buy a nice, new, fancy one. Lastly, you can hear an interview with Tova about her art over at ArtFilmDesign. I’ve got some time off work, so I’ve been working more on PIC programming, and have now figured out all the basic issues – I can program a chip from my Mac (see here for details). I was hoping to do some skiing this week, but the weather isn’t cooperating at all – it’s 50 and rainy in the city, which means it’s 40 and rainy in the mountains, and many of the resorts are closed between Christmas and New Year’s. Instead, I’ve started making a list of things to do in and around the city. There are some galleries & museums I’d like to visit (the Frye, SAM, and the BAM), along with a few restaurants (notably Salumi). I’m making more progress towards being able to program PICs from my Mac – check out the latest update here. Tova and Scott have a joint show called “Doin’ Lines with Scott and Tova” up at True Grounds in Ball Square in Somerville – there’s a reception this Saturday at 5 PM. Check it out if you’re in that ‘hood (I sadly no longer am). I picked up a copy of Tiger last night and had it installed in record time. I’m used to the upgrades taking several hours, but this one went quickly. I’m liking some of the new features (notably the Dashboard), I expect to like others (like Automator), and once I download Java, I should be up and running with HI-TIDE, an IDE for PIC development on the Mac. I’m making progress towards being able to program a PIC microcontroller with my Mac, as you can read about on the robot arm page. It’s been a little frustrating, but I’m close. I had some fantastic sushi tonight at Chiso. I’m not sure if it topped Kirala overall, but it came close, and the unagi was hands-down the best eel I’ve ever tasted. Also, inspired by It Must Have Been Something I Ate, I tried toro for the first time – heaven! For the first time in my life, I sang a song at a karaoke bar last night. And it wasn’t even horrible, I think (I really don’t sing too well, so it coulda been real bad). It was Jeff’s birthday, and he said what he wanted for his birthday was for me to sing. How could I say no? The light machine will make some sort of debut tomorrow night at dorkbot – I think folks there will have some good ideas of how to finish it off. I had an entirely enjoyable day visiting with Rif in Vancouver yesterday, in spite of the snow. The border crossing coming back took a little longer than I wanted, but I’ll definitely head back up there sometime for a longer visit. It’s really only 2 and a half hours away. I’m about to order a PIC Kit to start playing with microcontrollers for the robot arm. My goal is to have it working by birthday in March. 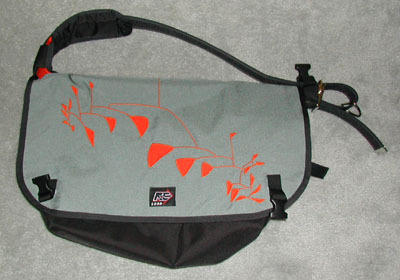 I’m off to Vancouver tomorrow morning for the day to meet Rif and show off the new bag.